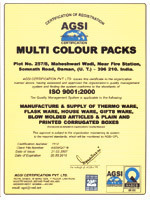 Established in the year 1998, Multi Colour Packs , Mumbai, has been a distinguished manufacturer of plastic thermoware, household and food containers. The superior quality of our products has ensured our strong presence in the global market and we have acquired an extensive clientele around the world. Our expertly crafted products are extensively appreciated the world over and we have an extended client base across many industries and corporations. Our range includes airtight container, Casseroles, flasks, plastic packaging boxes, soap dishes, water carriers etc. Our wide variety of thermoware and household products find multifarious uses and are supplied to clients in all corners of the world. We have also paid adequate attention to environmental concerns and ensured that waste disposal from our manufacturing facility is done in an environment friendly manner. With our product's quality, reliability, consistency, hygiene and flexibility we constantly endeavour to provide exceptional service to our clients. 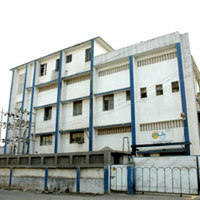 Our company started out as a small scale unit manufacturing of packaging products. After realizing its core competence in this field our organization expanded its scope to include plastic and thermoware products. Years of experience have made us well aware of market trends and consumer preferences and have instigated us to manufacture products that are relevant in the present day scenario. We have greatly benefited from the expertise of our management headed by Mr. Jagdish Bohra. Our organization has become a socially responsible institution under his leadership and guidance. 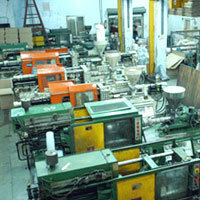 Manufacturing and Trading of Household Plastic Products.  Printing facilities-screen printing, foil printing. Supported by an efficient and experienced staff our infrastructural facility is adequately equipped to deal with bulk demand while producing flawless products. We have acquired complete client satisfaction with our dedicated and persistent efforts to provide excellent quality product and prompt services to our clients. Our clients are aware of our commitments and have placed their trust in us by their continual association with our organization. We cater to the requirements of our clients from diverse organizations and corporations. Pharmaceutical companies avail of our packaging boxes to safely package their products. All our team members are well versed and experienced in the norms and procedures regarding the production of our plastic products. Each member of our staff is handpicked for their skilful expertise in their respective domain and therefore brings a dynamism that increases productivity in our organisation. The company in turn performs its responsibility towards the welfare of our staff by running various welfare schemes for the employees and their families. We believe that the external and internal environment needs to be in harmony with each other for an organization to function well. We understand this concept and thus extend our responsibility towards the society. By running various welfare schemes for our employees and their families we have exhibited our intentions for improving the quality of life for them. We have also undertaken active participation in efforts to promote quality life for various underprivileged strata of society. We present an extensive collection of plastic containers, thermoware products, casseroles, flasks, soap dishes, packaging boxes and water carriers. Our range of airtight containers includes Shagun Containers, Ever-fresh Containers, SS Containers, Quadrant Containers and Smartline Containers. Our casserole range consists of Glory Casseroles, Emperor Casseroles, Elegant Casseroles, Flora Casseroles, Cuisine Casseroles, Chef Super Casseroles, Host Casseroles and last but not the least our newest range on the block, the Harmony Casseroles. The various containers and packaging products provided by us are utilized all over the world in many diverse applications. In keeping with our belief of harmonizing the external and internal environment, we have maintained a healthy and pleasant working environment for our work force. Added to this we have addressed the issues of pollution by ensuring that the waste disposal systems from our factory are environment friendly. We actively strive to promote greenery on and across our premises.